Mounts are a great way to increase your Hero stats and they will become even more useful to you when stabled, staged and equipped with a saddle. Stage Medals and Fodder are always available to purchase from the Item tab of the Shop. Additionally, Free Mounts, Stage Medals, Saddles and Fodder can occasionally be obtained through various in-game and forum events. In order to maintain your mount you will need to construct your Stable from City Hall. Upgrading your Stable increases your potential when manufacturing and recycling Saddles. Advanced mounts are ranked Epic or Legendary and will usually expire after 7 days but they can be stabled, saddled and staged. There are 7 advanced mounts which are obtainable in the game but some of them require that you achieve a specific goal in order to claim them. Examples of which include winning a Post Season playoff or completing a special time limited event boss such as Ancient Den and getting lucky with your picks. 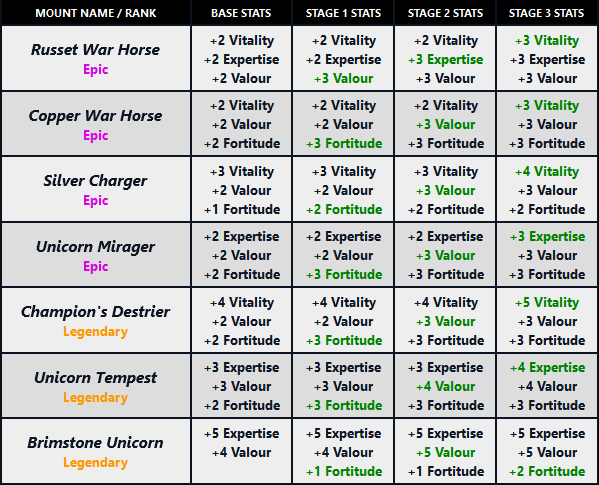 Check out the advanced mounts and the additional stats they will grant to your Hero when staged. You can equip your mount with a saddle to gain the additional advantages they provide. Saddles can be crafted in the Stable if you have the required amount of materials in your inventory. The saddle you craft will be random and it may take many attempts to gain the saddle you want. You can level up a saddle by recycling the other saddles you own. Double clicking a saddle in the Stable will equip it to your current mount (if they are compatible). You can also equip a saddle via the Hero inventory. Check out the Saddles Guide for more information on the saddles which are currently in-game. You can stable a mount to extend its lifespan. Payments must be made in Gold and the cost of stabling a mount decreases with each stage gained. Stabling a mount will increase the number of days that remain until the mount is set to expire. Once a mount is expired it cannot be recovered. You will need to feed your mount with the required amount of appropriately ranked Fodder in order to provide it with the growth needed to be staged. Fodder which is suitable for Epic mounts will cost you 30 gold and Lush Fodder which is suitable for Legendary mounts will cost you 80 gold. A fully loaded growth bar means your mount is ready to be staged and all you will need to complete the process is a Stage Medal which you can purchase for 300 gold. The appearance of your advanced mount will improve with each stage. The image below shows the transitions that a Champion's Destrier will go through when staged. Q: How long will a saddle last for? A: Saddles never expire so they can potentially last forever unless you recycle them to level up a better saddle. Q: Why has my mount expired? Q: Do I even want a mount? A: Of course you do, so go and get one. Mount that mount and ride it all the way to victory!